Now you can stay informed about the events of the day without ever touching your phone, thanks to a new podcast tweak to the hands-free mode in Apple's personal digital assistant. New news functionality using Hey Siri, left, vs. manual invocation, right. To try out Siri's new smarts, just say "hey Siri, what's the news today." If you're located in the U.S., she'll automatically begin playing the latest news podcast from NPR. Those with different tastes in information can choose to listen instead to Fox News, CNN, or the Washington Post. The selection varies from country to country, as noted by MacRumors - UK listeners have options including the BBC, Sky News, and LBC. What's not clear is why Apple chose to have Siri play a generic podcast rather than reading news headlines aloud. 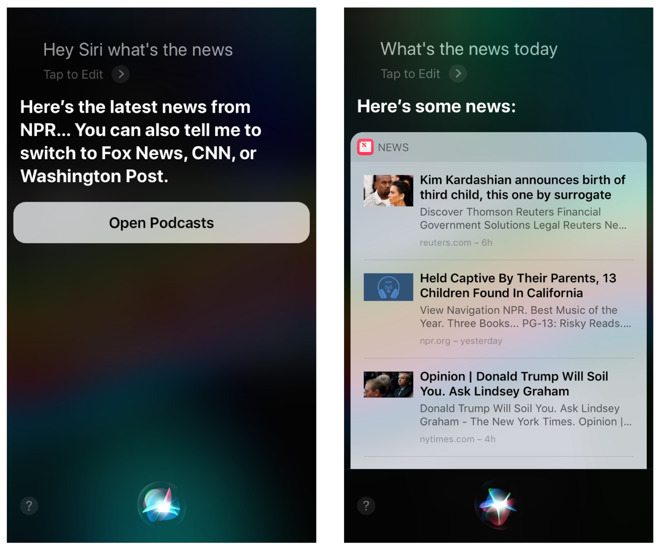 Users of Apple News can choose which subjects are important to them, and Siri previously relied on this self-curation to display the news in text format. Indeed, if you activate Siri by using a button on your device, she will simply revert to showing you headlines from Apple News. Those wishing to give the new podcast functionality a shot will need iOS 11.2.2 to do so. An update is highly recommended even if you aren't interested in the news - iOS 11.2.2 contains important security updates to deal with the recent Meltdown and Spectre vulnerabilities.